In the current scenario, marketing to mobile users is more than a necessity for doing business online. However, the million dollar question is which strategy to adopt for success? What marketing has surpassed much more beyond one could think and hence having a mobile-friendly site or an app will not meet your general requirements. We are here to highlight some great strategies which top mobile app development companies recommend for an effective and proven mobile marketing approach which can be useful in the coming year. Mobile has made the life of an ordinary man so easy and convenient that even for the smallest of query or advice they turn on to their smartphone and Google for any of the required questions. Also, this successfully gives them quick, precise and upfront answers. Also on the other hand, now users are less interested in long videos, complicated graphs or highly in-depth pie-charts. No one has time to go through all that; in fact, he or she expects bite-sized information in the moment of need and move on with his or her work. So, business owners need to optimize their mobile apps to accommodate all these scenarios; hence thinking ahead of time is the key to success. Therefore, we can summarize that Mobile app developers along with technology and business analysts need to create content that fits their requirement as well as be accessible instantly to their targeted users. QR codes are the quickest and the most natural mode of sharing relevant information to mobile users. The shoppers even use QR codes to compare prices. As per studies approx. 26% of mobile users, use their smartphones to scan the QR codes of the needed items to compare prices online. QR codes prove to be handy for those lucrative moments, and hence their value can’t be stressed. QR codes should be optimized in a way that your customers get the required info immediately rather than making them land to your company’s homepage, and they have to hunt back or forth for the information they need to move forward with this tasks. If you do not use these modern technologies, this can lead to total turn off, and you will miss business opportunities to your competitors or market leaders. The right strategy will instead streamline your user experience and delight your client in different marketplaces. It is not a new thing that customers turn to their smartphones even for location-specific information. This is not restricted only to citywide info instead it goes to the nearby locations as well. Here are a few ways how you can optimize your applications geographically. This not only helps in boosting your domestic sales but in the long run, it will help you build your brand reputation. Many mobile app development service providers offer these facilities to optimize your site. Your customers will love it when there is human interaction while they use your mobile app. This can be mobile chat assistance but in the form of voice. This will increase your client’s in-app interest and engage them with your mobile application. In the coming years, the smartphone market will rise by ten percentile, and along with that, app downloads will also increase. This all means that your app should be capable enough to meet the market requirement. Also, this can be achieved by having thorough planning and scaling capacity of the app being properly defined. You can even optimize your app to extract real-time data to understand the user browsing trend to boost the overall user reachability. This will help you plan your marketing and sales strategies. The competition in the mobile industry is so much that you cannot afford to make a mobile app or website live which is full of errors. Even the smallest of loophole is enough to ruin your brand image and make way for your competitors. Hence before making the app live do thorough quality checks of your app. There are millions like you putting their best possible efforts to get the attention of their targeted audience. So, it becomes a necessity to deliver a perfect app for a seamless in-app experience for the users. Mobile marketing has made life much easier for businesses now a day as they can reach their customers any day, anytime or from any location. As the sky is the limit doing the right things at the right time will work wonders for you and will reap positive results in the long run. Mobile marketing gives many scopes as businesses can directly be part of their customer’s journey. All the points mentioned above like thinking at a micro level, streamlining the in-app experience and enhancing the way communication can be made through Voice Assistance within the app; these will surely bring direct positive results. If you are planning to create an app or optimize your existing application, you can always outsource your project to mobile app development companies in India. To better understand the mobile marketing strategy for your business app, reach out to the experts and discuss the opportunity. All you need is a great mobile app development team or a technology consultant who can guide you through to strengthen your business reputation through the right strategies and tactics. 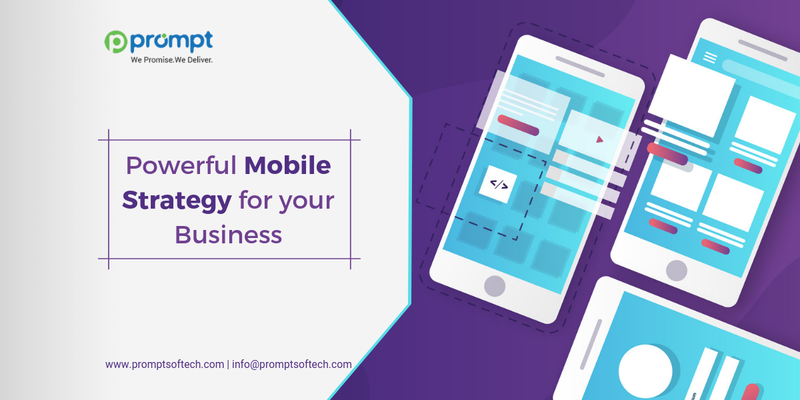 We at Prompt Softech are a web and mobile application development company positioned in India with both local and global clients. We offer IT solutions and services covering industry-specific technology to provide the best results to our clients.